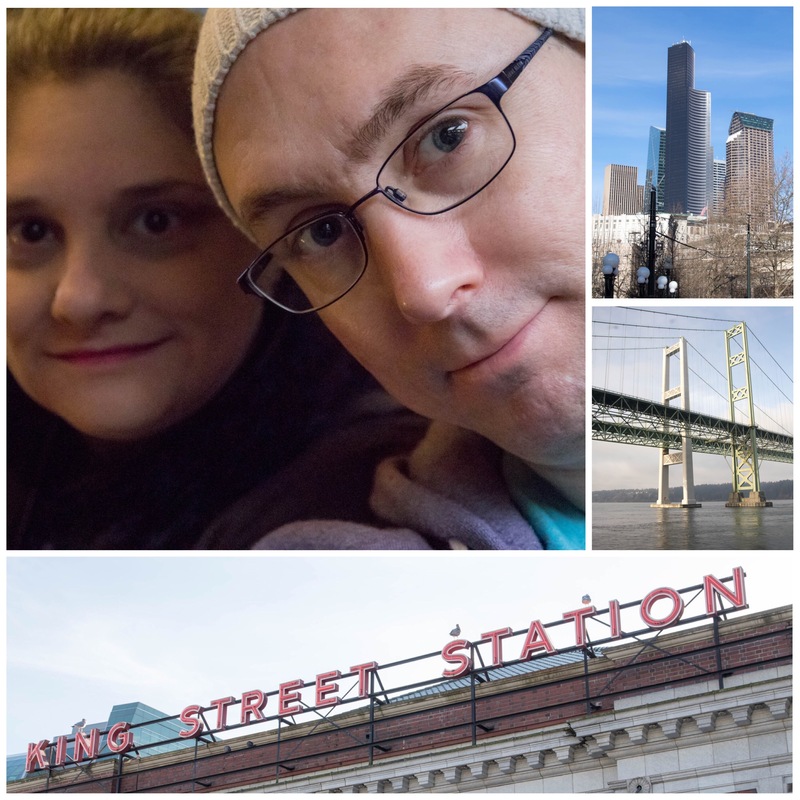 On Saturday, Kender and I made a one-day adventure up to Seattle, via Amtrak. Llewellyn had a booth at the American Library Association’s Mid-Winter Conference, and I got to visit as an author. It was our first time on the train and what a nice experience it was. Our business class seats gave us great views of the land and were cozy enough for me to get in a small nap. Kender and I, and several images from our trip to Seattle. Safely at King Street Station, we made the brisk walk around the city to the Washington State Convention Center. The streets were packed with lots of attendees and tourists. After taking four flights up the escalators, we got our exhibitor badges and went off to find our booth for the day. We arrived a few hours before my signing, which gave us time to eat and schmooze around the exhibitor rooms. Llewellyn had a great spot in between some well-known publishers. I spotted this nerd’s new book. Thought about stealing a copy but sadly, Llewellyn only had two on hand. Books lined every available space of booths everywhere. This conference was a bibliophiles heaven. Kender put the exhibitor’s hall best with “This is like being inside a Scholastic Book Fair,” and it really was. Publishers stood everywhere, with books in hand, just waiting for someone to take whatever ARC they offered. From what I could tell, the purpose of the ALA conference was for publishers and authors to connect with librarians and educators to get books into schools and libraries. I’ve never been intimidated to receive free books, and yet, I was so overwhelmed that I didn’t go wild. I did end up with a few goodies (which I’ll share at the end of this post). After all, the main reason I was there was to sign a stack of Tarot Inspired Life. I did succeed at making my secondary goal of finding a copy of Chuck Wendig’s Wanderers (which comes out later this year). Sadly, Chuck was not in attendance due to a stomach bug. We soon moseyed back to the Llewellyn booth. Kat and Katie had brought a large stack of Tarot Inspired Life up from their boxes, arranged and ready for me to sign. At 3pm I took my spot and chatted with attendees and signed many copies of the book. 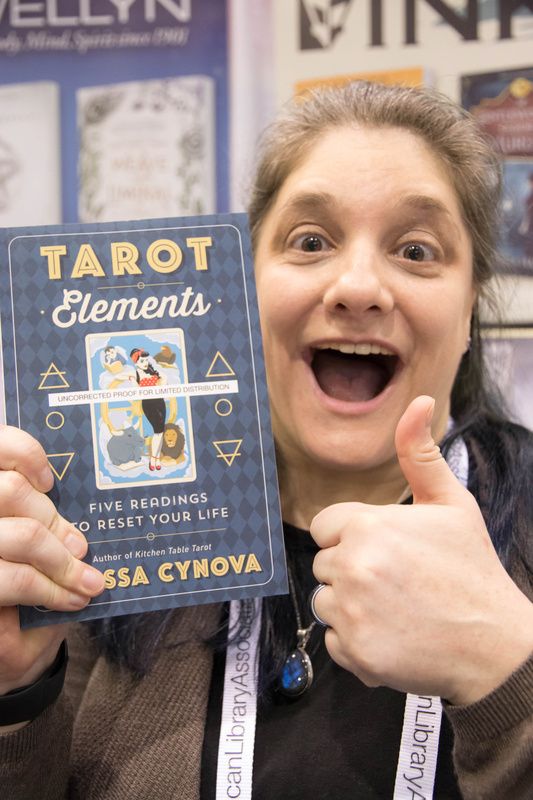 I helped librarians find ways to get Tarot Inspired Life onto their shelves, discussed how educators could fit parts of it into curriculums, and even signed a few personalized copies for tarot enthusiasts. We sold out of all the copies on hand in 30 minutes. Woot! Go me. Look at me do the thing. So many books. One happy author. We wrapped up our day adventure with Kat treating us to an afternoon meal and drink. I got to pick her brain about publicity and other business workings. I’m so glad I made the trip up. It was definitely something I’ll never forget. Thanks to everyone who came out and introduced yourself to me. I hope you enjoy the book! To those who are local to the Pacific Northwest, I hope I get to see you in March for the NorthWest Tarot Symposium. 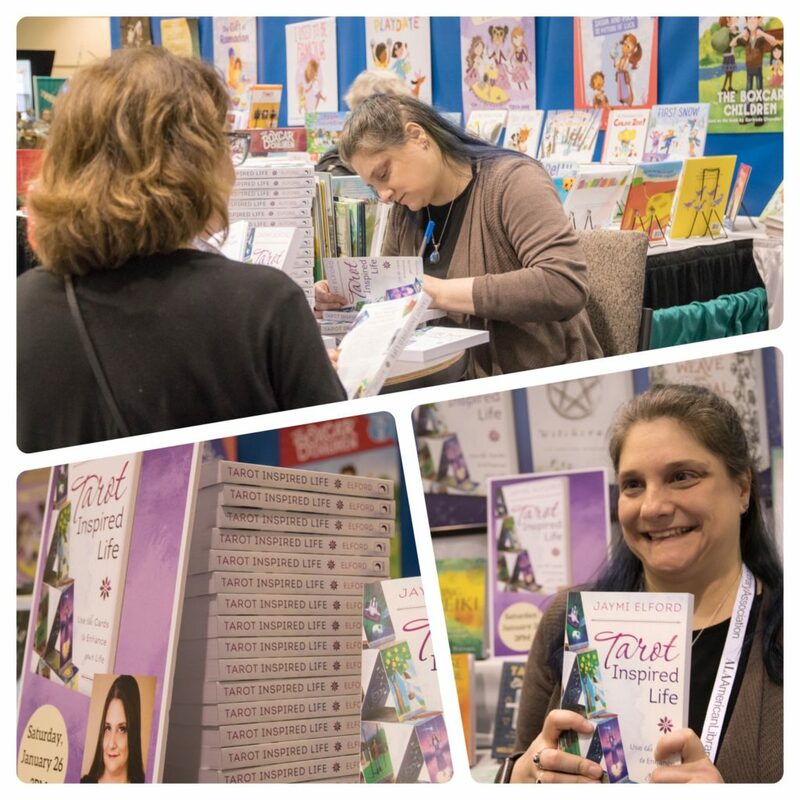 Thanks to Kat and Katie for extending me the opportunity to come up and help Llewellyn position Tarot Inspired Life and the other books for librarians and educators everywhere. The loot from ALA Mid-Winter. Not too shabby. Want to see TIL in your library? Contact your branch librarians and ask them to order a print, or ebook, copy for their catalogs! Oh, and about that loot. Here’s what I was able to bring home in my daybag. 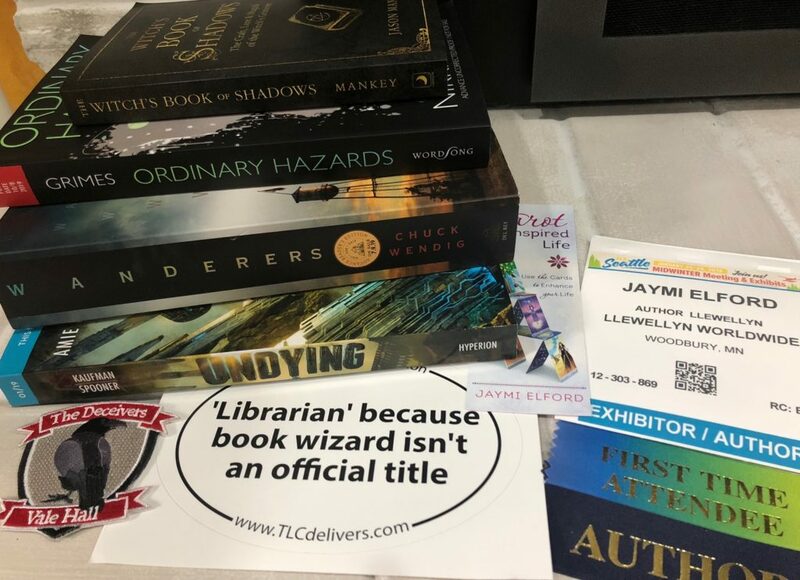 I got 4 books, a cool librarian sticker, a raven patch, a stack of Tarot Inspired Life bookmarks for me to hand out, and a badge bearing the honor of being published. Next time, I’ll have to be better prepared for all the goodies everyone was handing out. Both kender and myself are very proud of the restraint I showed while standing next to ALL those tasty new Llewellyn titles.